"Don't call me m'lady, call me Rose." Inspired by Lady Rose, niece and goddaughter of the Dowager Countess Violet, Pretty Lady Rose is the second in a collection of garden roses named after characters of the popular Downton Abbey series. Lady Rose's namesake shares many attributes with the character such as elegance and strength. The era in which this British show takes place is well represented by the LARGE old-fashioned and English style multi-petaled aristocratic-like deep pink flowers of this pretty rose. The very long lasting flower coloration is enhanced by the sweet scented peony-like and spices fragrance similar to the perfume a noble woman of the period might have worn. Like an upper class damsel, the plant is well dressed with an evening gown of healthy bright glossy medium green foliage. With her compact habit, this selection brings elegance to smaller spaces of the garden and also looks great in pots. 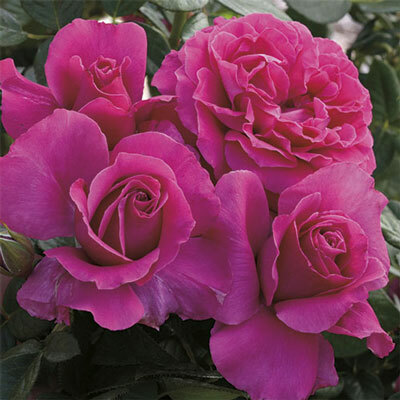 Pretty Lady Rose holds her flowers at the perfect height to be admired and to allow you to enjoy their aroma.